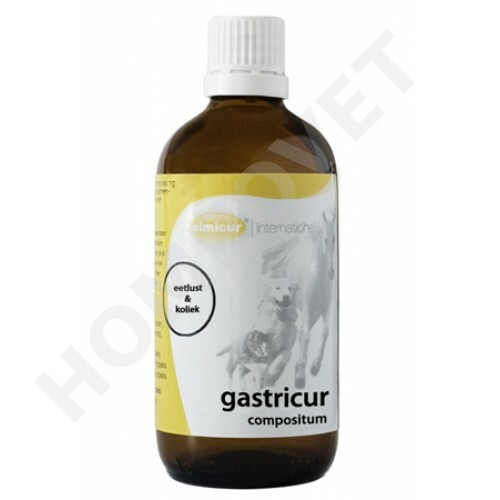 Gastricur is a homeopathic tincture in a 100 ml dropper bottle of SIMICUR for oral use in dogs, cats, horses and ponies. Application: Attached to the Gastricur lining provides optimal blood flow to the digestive organs, which it has a strong protective and healing effect on the stomach and intestinal system. Gastricur the same time has a stimulating effect on the secretion of digestive juices, which leads to optimal digestion of the food. Gastricur be applied in appetite, recurring colic symptoms and inflammation of the stomach and intestines. Effect: By strengthening the functionally interconnected organs stomach, liver, pancreas and intestines Gastricur has a strong protective and healing effect on the digestion and metabolism (Rosmarinus officinalis). Gastricur has a stimulating effect on the secretion of digestive juices (Artemisa absinthum) whereby the bowel function is optimized. At the same gastro-intestinal movements are regulated (Acorus calamus), so that Gastricur is a protective effect on intestinal colic. Gastricur has a strong protective and healing effect on the digestive organs.